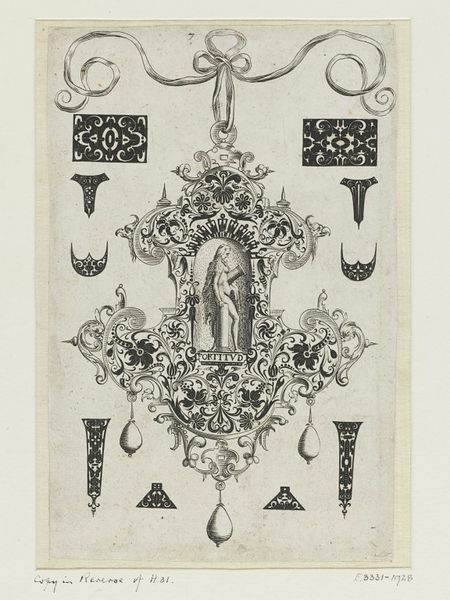 An engraving depicting a design for a pendant. The allegorical female figure of Strength, shown holding marble columns, appears in the centre of the pendant. Beneath her the Latin word for strength 'fortitud' is written. Signed with the monogram 'DM' in the lower left corner and lettered 'F.' in the lower right of the plate. Hollstein, F. W. H., et al. The New Hollstein, Dutch and Flemish etchings, engravings and woodcuts, ca. 1450-1700 (Amsterdam: Menno Hertzberger, 1956): vol. 4, nos.313-320. de Jong, M. and de Groot, I., Ornamentprenten in het Rijksprentenkabinet I, 15de & 16de eeuw, ‘s-Gravenhage, 1988, nos. 373. 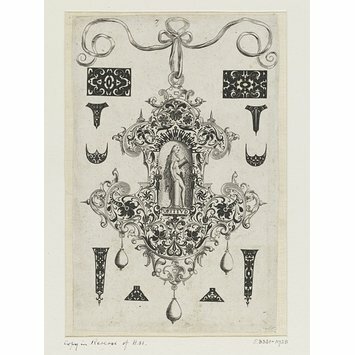 Fuhring, P., ‘Ornament Prints in Amsterdam’ (Review of M. de Jong and I. de Groot, Ornamentprenten in het Rijksprentenkabinet I, 15de & 16de eeuw) in Print Quarterly, vol. VI, no. 3, September 1989, pp.322-34. Hollstein, F. W. H., et al. Hollstein’s German, engravings, etchings and woodcuts, ca. 1450-1700 (Rotterdam: Sound and Vision Publishers, 1980): vol. XXVIII, no.227.